Newsweek's new format includes fewer S's, apparently. 1. Why this disease is really bad and why you may have it. 2. Breaking info about Jesus. 3. Baby boomers feel a certain way about something. But the single, one story that really pushed me over the edge was the cover story, by Fareed Zakaria no less, entitled, "What Bush Got Right." The only way it could've redeemed itself at that point was to run blank pages inside the cover but, alas, it was an actual story. So, today the newsweekly presented its new look and format, which - according to Howard Kurtz at the Washington Post - is "reporting and argument." Each issue will be divided into four parts: Scope; Features; The Take; and The Culture. 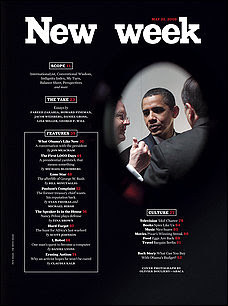 "Newsweek, whose circulation was as high as 3.1 million in recent years, plans to cut that to 1.5 million by the beginning of 2010, in part by discouraging renewals. The magazine will begin charging the average subscriber about 90 cents an issue, nearly double the current rate." To recap (something the new Newsweek is promising not to do): half the mailing at twice the cost = success! So, that begs the questions: if you're a current Newsweek subscriber, what should you do? Should you wait to find out if you're the "right" subscriber, or should you just cancel your subscription now, just in case? "The staff doesn't understand it," says Meacham in Kurtz's second 'graph. Yeah, it used to be that you wanted as many readers as possible to read what you'd written. Go figure.